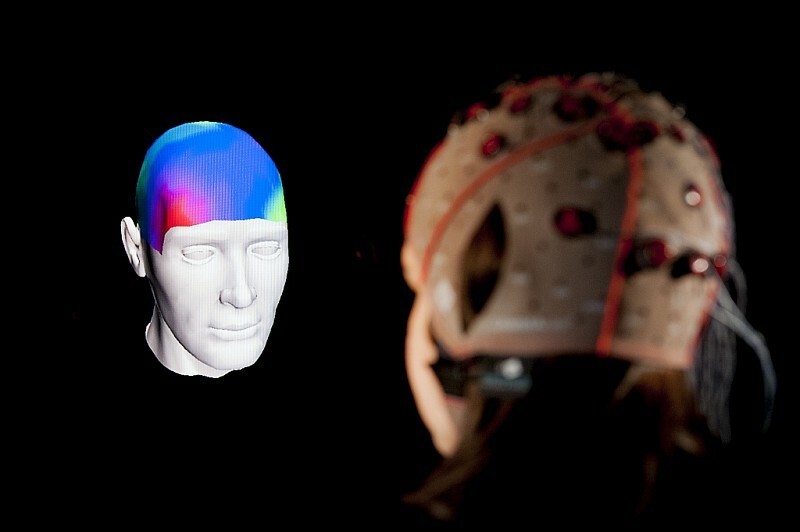 Brain-Computer Interface (BCI) are devices that enable its users to interact with computers by mean of brain-activity only, this activity being generally measured by ElectroEncephaloGraphy (EEG). A typical example of a BCI would be a system in which a user can imagine movements of his left or right hand in order to move a cursor on a computer screen towards the left or right respectively. BCI systems are a very promising tool for severely paralysed people such as those suffering from late-stage Amyotrophic Lateral Sclerosis (ALS). Indeed, for those people, BCI can be the only mean of communication with the external world. Some BCI research groups have actually designed BCI prototypes with which disabled people could operate a text editor or a prosthesis. However, BCI can also be a promising interaction tool for healthy people, with several potential applications in the field of multimedia, virtual reality or video games among many other potential applications. Can new EEG visualization techniques improve user learning of a Brain-Computer Interface skill? However, although very promising for numerous applications, BCI mostly remain prototypes not used outside laboratories, due to their low reliability. Poor BCI performances are partly due to imperfect EEG signal processing algorithms but also to the user, who may not be able to produce reliable EEG patterns. Indeed, BCI use is a skill, requiring the user to be properly trained to achieve BCI control. If he/she cannot perform the desired mental commands, no signal processing algorithm could identify them. Therefore, rather than improving EEG signal processing alone, an interesting research direction is to also guide users to learn BCI control mastery. Our current work aims at addressing this objective. We notably explore theoretical models and guidelines from psychology and cognitive sciences about human learning in order to improve BCI training protocols. Our studies notably illustrate the theoretical limitations of current standard BCI training approaches and the need for alternative approaches. We also perform some actual experiments to further illustrate some limitations of current BCI training protocols and try to understand and analyse them. We notably study which users’ profile (personality and cognitive profile) fail or succeed at learning BCI control. Overall with are working towards formally modeling BCI users and BCI control skill acquisition. Finally, we explore new feedback types and new training tasks in order to help users to learn BCI control skills more efficiently. These new feedback and tasks notably aim at providing BCI users with more information about their EEG patterns, in order to identify more easily relevant BCI control strategies, as well as motivating and engaging them in the learning task.